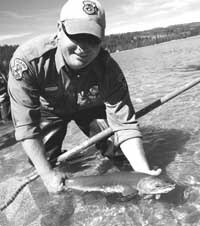 An endangered sockeye salmon is released into Redfish Lake south of Stanley. Ocean-running salmon and steelhead must swim about 900 miles to spawn in the Salmon River in the remote Stanley Basin north of Ketchum. Theirs is one of the longest runs of any ocean-going fish in the world. Regional salmon advocates would like to make the trip a lot easier, by removing hydroelectric dams on the lower Snake River. Four species of ocean-running fish once returned to Idaho in immense numbers, perhaps as many as 2.5 million fish each year. Sockeye salmon, colored deep red while spawning, gave the name to Redfish Lake near Stanley. Damming, over-fishing and destruction of habitat over many years reduced the number to a trickle during the last century. Idaho's coho salmon went extinct in 1986. Only 22 endangered sockeye salmon, on average, returned to the state during the 1990s. Steelhead is a threatened species today. Thanks to legislated conservation efforts, including the use of spillways, fish ladders and barges, and fish hatcheries, steelhead and salmon are coming back from the brink of extinction. Last year 1,300 sockeye returned to the state, a significant increase, but no cause for celebration among fish advocates. "It is a hopeful sign, but we do not want people to take home an illusion of a recovery," said Greg Stahl, assistant policy director at the advocacy group Idaho Rivers United. "Only 2 percent of the 2.5 million fish that used to come back to Idaho come back today, and the vast majority of these are hatchery-raised fish," Stahl said. A recent surge in returning steelhead (212,000 last year) brought further signs of hope, and an unusual open season on the species for sport-fisherman. But only 15 percent of the steelhead were wild, Stahl said. Idaho Rivers United, the state of Oregon, the Nez Perce tribe and about 50 environmental groups have sued the federal government to make changes that would increase the runs enough to de-list the remaining endangered and threatened species. Fish advocates maintain that the greatest challenges to the return of healthy runs of salmon and steelhead are hydroelectric power-producing dams on the Columbia and Snake rivers. "Our goal is to increase the runs of salmon and steelhead to Idaho. We think the best way to do that is to remove the four lower dams on the Snake River," Stahl said. Four federal court cases over the last 20 years have brought attention to the salmon and steelhead recovery issue, and some hope for the recovery of the species. Federal District Court Judge James Redden could increase those hopes this summer. Redden is expected to soon make a ruling on a federal recovery blueprint, called a "biological opinion," that was drafted under the Bush administration by the National Oceanic and Atmospheric Administration's fisheries bureau in 2000. It is the fourth such management proposal, and the second iteration of a plan that was written by the Bush administration in 2008, and later rewritten by officials working for the Obama administration. Fish advocates say the opinion, if it is followed, will fall far short of securing a successful recovery. Idaho Rivers United Conservation Policy Director Kevin Lewis said the Obama plan compounds problems built into the Bush document, rather than solving them. "It's sad that this administration has allowed the interests of a few commercial and industrial river users to influence its decision on Columbia-Snake river salmon," said Lewis in a prepared statement. Redden, 82, has repeatedly admonished the federal government over the last 10 years by sending the opinion back for revision, saying the plan would not adequately increase the number of returning salmon and steelhead to their spawning grounds. Lewis is hopeful that Redden will maintain his stance in support of conservation and recovery. "We cannot try to guess what the judge will do, but the future of Idaho's salmon and steelhead depend significantly on this decision," said Lewis. Redden's decision on the latest recovery plan could come as early as June.